1. I know exactly what it is I’m eating, meaning I am educated about the ingredients within my food. 2. I know how to pronounce every ingredient I’m eating. When I first heard quinoa, I would pronounce it kwuh-no-uh for a few months until a friend was kind enough to correct me. I later learned that it is pronounced keen-wah. There are many foods or food ingredients that are hard to pronounce and aren’t necessarily the best thing for your body, but quinoa, though hard to pronounce, is a very highly nutritional superfood. So we know how to pronounce quinoa. Now, what is it, and what are the health benefits of quinoa? Although you might hear quinoa being declared as a “supergrain” and “the mother of all grains,” it is actually a seed from the plant, chenopodium quinoa. You might want to think of it as a seed for better health. “Quinoa is about as close to a perfect food as you can get,” according to the Optimum Nutrition Bible, containing quality protein, iron, fiber, essential fats, vitamins and minerals, and providing almost four times more calcium than wheat. 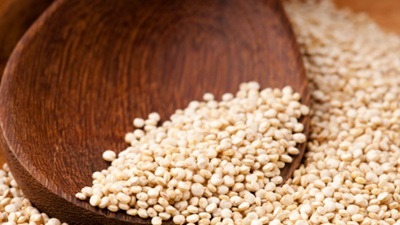 Here are the five top health benefits of quinoa that you need to know about. This seed can be a great side dish or hearty meal for vegetarians, vegans, or anyone keen on getting a healthy protein in a balanced diet. It is a well-known complete protein, which means it contains the nine amino acids that the body needs from food. In particular, quinoa contains greater amounts of the essential amino acids lysine and isoleucine, which help build new muscle and repair damaged tissue. Quinoa is high in magnesium and riboflavin (vitamin B2), which help blood work more efficiently. The magnesium in quinoa helps improve blood pressure, where your blood is less likely to clot, and the heart will beat more regularly. The fiber in quinoa also helps reduce high blood pressure, another one of the important benefits of quinoa. Another one of the benefits of quinoa is that it is a good source of fiber, meaning it is a key macronutrient for healthy blood sugar regulation. Having a strong intake of protein and fiber are two dietary essentials for regulating blood sugar levels. The diverse range of anti-inflammatory nutrients in quinoa helps reduce the risk of diabetes. With quinoa being gluten-free and high in fiber, it makes this seed easy to digest. Quinoa is a rich source of both soluble and insoluble fiber—both aid in digestion. Insoluble fiber holds water in the large intestines, promoting soft, bulky and regular bowel movements. With quinoa being rich in overall nutrients, it is easy to process, easing the work of the digestive system. Quinoa is low in fat and calories, which means this helps you maintain a healthy weight. You also don’t crave more food after eating quinoa because the body gets an adequate amount of nutrition from the “superseed.” You could find that your late-night cravings subside after eating quinoa around dinner. Quinoa comes in a variety of colors, including traditional white quinoa, red quinoa, and black quinoa. Red and black quinoas have stronger flavors than the traditional quinoa. It can be used as an alternative to rice. Quinoa also comes as flakes or flour. All quinoas can be found at your health food store, while the more traditional (white) quinoa can be found at most grocery stores. Quinoa flour pastas are a great gluten-free alternative, and because quinoa is starchy, you would find it paired together with grain and seed flours such as rice or amaranth. To reap the benefits of quinoa, make sure you’re eating it right! Preparing quinoa is similar to rice, although be sure to wash it well to rinse away the residue left from quinoa’s protective coating called saponin, which can cause stomach irritation. Bring one cup of quinoa and two cups of water, plus your preferred spices, to a boil. Reduce heat to low, cover and cook for 15 to 20 minutes. Let stand five minutes then it is ready to serve or add to any dish such as salads, soups, pastas or puddings. One cup of quinoa makes about four servings. Krop, J., Healing the Planet: One Patient at a Time (Alton: KOS Publishing Inc., 2002), 159. “Complete Protein,” Wikipedia the free encyclopedia web site; http://en.wikipedia.org/wiki/Complete_protein, last modified Aug. 31, 2013. Health Tips, “4 Benefits of Lysine Supplements,” Swanson Health Products web site, May 1, 2012; http://www.swansonvitamins.com/blog/health-tips-2/4-benefits-of-lysine-supplements. “Isoleucine Benefits,” HealthFoodBenefits web site; http://www.healthfoodbenefits.com/amino-acid-benefits/isoleucine-benefits.html. “Quinoa: What’s New and Beneficial About Quinoa,” The World’s Healthiest Foods web site; http://www.whfoods.com/genpage.php?dbid=142&tname=foodspice. Yeager, S., The Doctors Book of Food Remedies (U.S.: Rodale Inc., 1998), 462-464. Holford, P., The Optimum Nutrition Bible (Croydon: Piatkus Books, 1997), 55, 57. Haas, E., Staying Healthy with Nutrition: The Complete Guide to Diet and Nutritional Medicine (New York: Ten Speed Press, 2006), 329. Kalmus, S., “Is Quinoa Good For Digestion?” Live Strong web site, June 9, 2011; http://www.livestrong.com/article/467184-is-quinoa-good-for-digestion/. Wilcox, J., “7 Benefits of Quinoa: The Supergrain of the Future,” MindBody Green web site, May 31, 2012; http://www.mindbodygreen.com/0-4994/7-Benefits-of-Quinoa-The-Supergrain-of-the-Future.html. “Quinoa, What is Quinoa? Quinoa Benefits, Side Effects, Nutrition Value Facts and Information;” http://www.seedguides.info/quinoa/. “Types of Quinoa,” Whole Grains Council web site; http://wholegrainscouncil.org/node/5881/print. Luks, J., “Quinoa 101: Red, White, and Black,” Vegan Good Eats web site, April 15, 2010; http://vegangoodeats.com/2010/04/quinoa-101-red-white-and-black/.